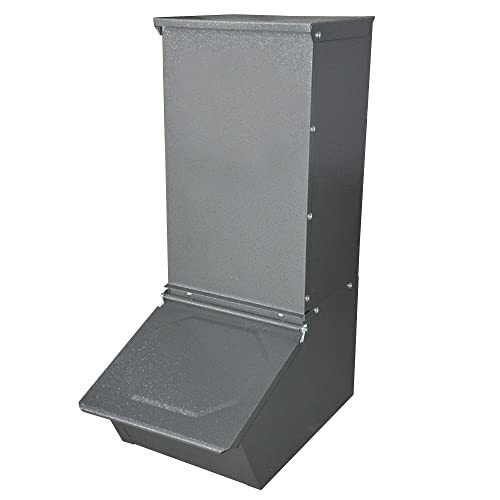 Buying the best hog feeder increases the chance of gaining success in hunting down hogs. In past, feeders were only used for domestic purpose. But nowadays, people are finding a lot of interest in hog hunting. Many of them are also hunting hogs for rescuing their crops. The most effective way to hunt hogs is using feeders. The hogs are not that much clever like other animals in the jungle. They think with their stomach. So, when you put the best hog feeder in a proper place, hogs will come out and fall in your trap. Best hog feeder has a good feed adjustment feature. It will help you to adjust the feeder according to your wish. It will be also made of strong metals. Because hogs can sometimes cause trouble to the feeder in rage. Moreover, hunters are using feeder lights so that they can utilize the advantage they get from the hog feeders. So today, we are going to show you some hog feeders along with few feeder lights. These hog feeders were picked after judging their every part and facility. They can surely help you hunting down your preys. Let’s take a look at those chosen feeders’ review below. Combination of feeder light and feeder is like arrow and bow. So, we firstly, are showing you one of the finest feeder light duos in the market. The two major features are solar system and PIR motion sensor system. The solar energy system is capable of recharging the batteries of the lights pretty quickly. When the lights are fully recharged, it can perform a whole night long without any problem. The motion sensor feature can sense the presence of any animal near the lights precisely. When it detects any activity they turn on and help you to see your prey. Along with these features, the set has some other features like easy installation, weather safety and many more. Made for only hunting hogs at night. The PIR motion sensor facility is integrated. Each one has 18 green LED lights. Li-ion battery of 2000 mAh is used in both lights. Multi-level protection ensures the set to be durable and strong. Brower is a name familiar to most of the hunters. This company has made many feeders. Each can claim itself as one of the best hog feeders. The size of this feeder is neither bigger not smaller. The size is actually perfect for common hog hunting trips. 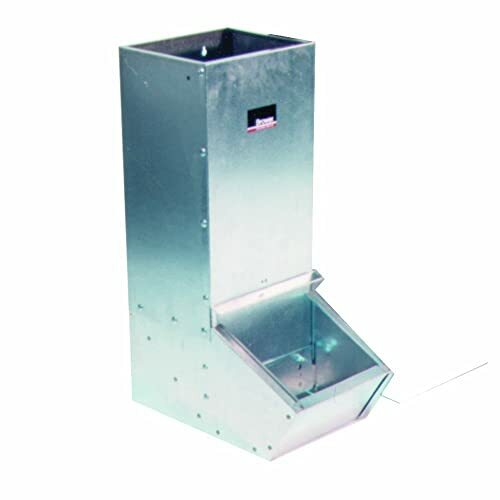 This feeder is approximately capable of feeding more than four hogs without any problem. You will not find anything exceptional about this feeder. But still, one thing is sure. It can produce all basic needs what an ideal feeder does. We picked this feeder as the top one because it has a very tough construction. It will not break that easily. You can use this feeder on several hunting trips without facing any issue. Moreover, the feeder doesn’t get affected by weather conditions. It can perform in any place in any condition. Apart from hunting purpose, this feeder can be used for other reasons too. Has one of the strongest structures that helps the feeder to stay strong in any condition. Made of Galvanized steel of 20 gauge. Capable of feeding more than 4 hogs at the same time. Needs much effort in assembling the feeder parts. The screws and screw holes are average in quality. The company, Miller is famous for manufacturing feeders that have very strong metals. This feeder is also one of them. Galvanized steel is used to assure the durability fact of the feeder. This feeder is eligible for both hunting and domestic purposes. It can perform in harsh conditions too. Attacks by hogs won’t cause any trouble so easily. If you are willing to use on your farm when you are not hunting, then you are free to do so. You can then hang this on wall precisely more facility. There is a door at the very top of the feeder. This is given so that you can load the feeder quite easily. The feed doors have a unique design. It can keep feeds well even in bad weather conditions too. The feeder comes completely assembled. So you don’t have to put any extra effort in this feeder. Galvanized steel is used to give the feeder a good structure. 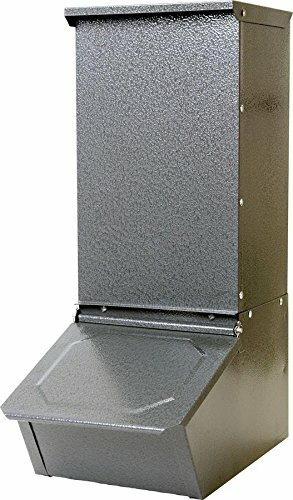 Feed doors have can help you keep the feed good which can help you in hunting. A top door is integrated so that you can load the feeder with ease. The feeder doesn’t need anything to assemble. Comes fully assembled. The joints are not sturdy enough. You might need to repair them if they fall apart. 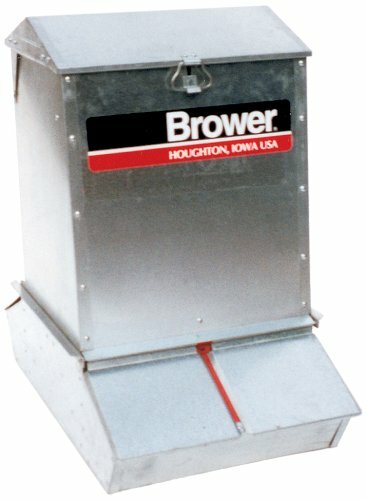 With a stiff construction, this feeder of Brower can truly provide you with service for several years. The manufacturer has given it such structure that it can satisfy any hunter easily. The structure ensures the feeder will not get any serious damage because of big hogs’ attack. Even weather cannot stop this feeder from performing the best. Even the largest hog of the jungle will be able to eat comfortably and fall into your trap. As the size is big, so is the capacity. This feeder can feed more than 20 hogs without any problem at the same time. You can kill several hogs in a short time. The feeder has two feed slides. These slides are adjustable from the outside. The manufacturer has only used quality steel to make this feeder. So, you can expect them to perform like new ones even when it gets old. These are the reasons why any expert will recommend you this feeder if you desire to have a long hunting journey and outstanding performance even after several years. The feeder has 16 gauge doors. Wide enough even for the largest hogs in the jungle. The feeder can feed 20 large hogs at the same time. Doesn’t get affected by any bad weather condition. Feed slides are adjustable from the outside. The swing-type hinges are integrated. Takes time to get assembled. The feeder comes totally unassembled. This feeder light can be an ideal choice for hog hunting. It can easily help you hunting whole night long. The motion sensor of this light is fascinating. It performs really well. It can detect any kind of movement of an animal or a human near the light. It will turn on automatically when hog will come closer in search of food. When the sensor will find no movement within thirty seconds of turning on, it will also automatically turn off. 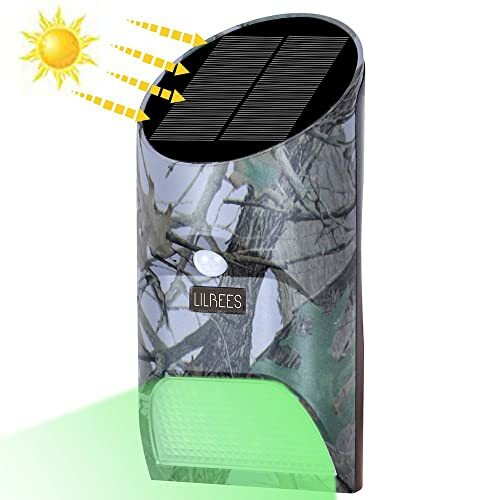 The solar charging system of this light makes this more useful to the hunters. Hunters don’t need to do anything extra for recharging. The light will be recharged automatically in the daytimes and will be ready for the next night. The brightness of the light is adjustable. You can increase or decrease the light precisely. This awesome light can also be used for other purposes such as camping, home security and many more. 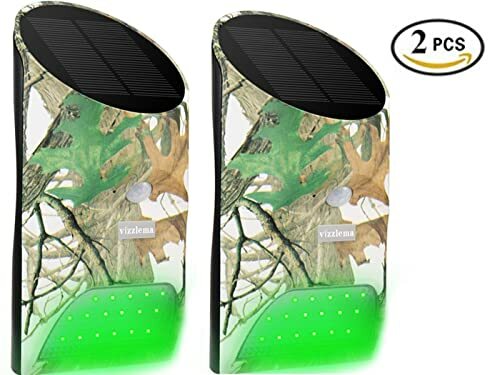 Solar charging feature integrated with 2000 mAh battery. The light can protect itself from rain, dust etc. It contains 18 LED green lights. PIR sensor works fine and saves more energy than other sensors. A user can install the light quite easily. Can be used for other purposes apart from hunting hogs. Though the light works well but will not last long like most others for cheap construction. We are now presenting you one of those feeders which can behave pretty much friendly with the hunters. This strong feeder comes fully assembled. So, you don’t have to waste your valuable time in assembling the feeder. All you have to do is unpack the feeder and carry it to the jungle. The steel used to make this feeder is quite rigid. It lets you use this feeder for a longer time than many other feeders. There is also a feed saver lip for the user’s satisfaction. You can mount this feeder anywhere you want. You can also mount this feeder quite easily. Because the manufacturer already made mounting holes on the back of the feeder. There is also a top door integrated. It will help you to load the feeder with ease. Top door enabled so that a user can load the feeder with feed quite easily. The capacity of the feeder is 50 pounds. The feeder comes completely assembled. The feeder lip integrated to produce more facility. The manufacturer has used heavy gauged steel to make the feeder. The feeder might leak after a few years of consistent use. There is nothing new to say about the Brower if you are hunting hogs for a pretty long time. Like other feeders, the manufacturer also ensured the fact, durability here. Every part of this feeder is capable of behaving strongly in any kind of harsh moment. The joints of this feeder are quite strong. So, simple attacks by hogs will not be able to cause any harm. The quality of the metal used in this feeder is also satisfying. A user can also control the flow of the feed according to his comfort in this feeder. You can hang this feeder with trees for a better result. Moreover, you can assemble this feeder quite easily. It takes less time than others to get assembled. You can save feed using this feeder on hunting. This feature can save your plenty much time while you are on a hunting trip. The feeder has a Galvanized steel construction. Capable of providing service for several years consistently. Adjustable feed gate enabled for controlling the flow of the feed. Feeder body can be assembled very easily. The feeder has the capability of feeding more than 4 hogs at the same time. The instruction given with the feeder is not clear enough. Amateurs might not be able to understand. We told you earlier that feeder lights can help you utilize the advantage you get from your feeder. Now we are showing you a very effective and useful hog feeder light. The manufacturer is Libees. The solar power system is truly awesome. During day times, this light’s solar panel converts the solar energy into electricity. It helps the light to get charged quickly to help you at night. The automatic motion sensor is one of the major features of this light. It can easily sense the presence of any human or animal near the light. The light will automatically turn on and help you to see your prey properly in dark. This feeder light has green LED light. These light are powerful and capable of enough illumination around the feeder. This great performer can be installed pretty easily. You can strap this light anywhere you want. 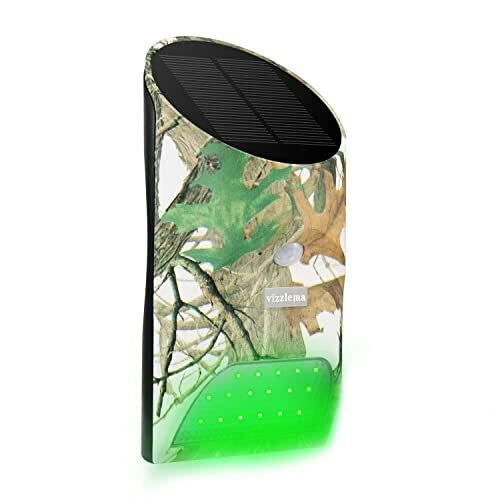 Has a camouflage pattern which makes it more eligible for hunting. 2000 mAh Li-ion battery is integrated for storing enough energy. Automatic PIR motion sensor is integrated. Turns off in 30 seconds to save energy. 18 green LED lights are integrated. Waterproof feature integrated. Makes the light eligible for any weather condition. Easy installation feature enabled. Hunter can strap it to both feeder and tree. You don’t have to buy a large hog feeder and waste your money if you intend to go for shorter hog hunting trip. 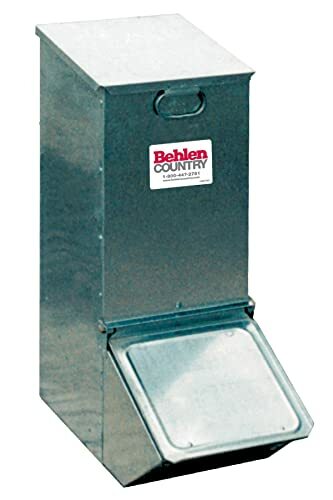 For this type of purpose, we are now showing you Behlen Country’s 70120058 feeder. The size is quite smaller than the other ones. So, when you intend to hunt down very few or a single hog, you can use this to get facilities. 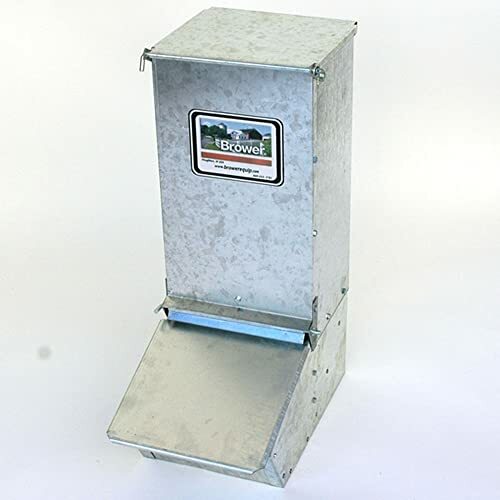 Like other strong feeders, this feeder is also made of heavy Galvanized steel. We all know how much useful galvanized steel is. It will help the feeder to stay strong even when the hog attacks. That is why you can use this for several years without facing any issue. Though the structure of this feeder is small, it still capable of holding much ground feed. The feed adjustment control system is another positive side of this feeder. It will help you to save the feed. It will also help you to control the flow of the feed. Has a heavy galvanized steel construction. Capable of holding almost 72 pounds of ground feed. Eligible for shorter hog hunting trips. The through feed adjustment control system is integrated. Durable enough to provide you service for several years. 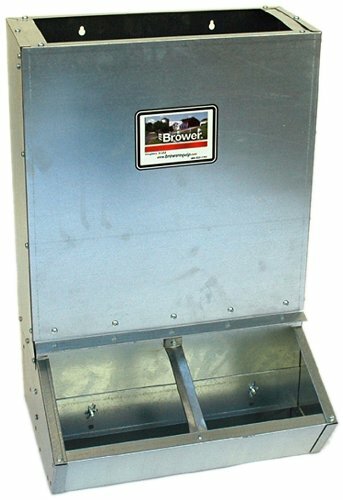 Brower’s this feeder has most of the primary facilities a good hog feeder can provide. You can be satisfied with the performance of this feeder for a quite long time. The main facility this feeder provides is the durability. With durable construction, the feeder can go through many rough conditions. The material is quite sturdy too. This stiff material helps the feeder to perform better. Apart from all these, this feeder has some other friendly features too. This feeder can feed more than eight hogs at the same time. Though we are presenting this feeder for hunting purpose, you can also use it for your farm too. You can hang this product with trees when you are using this for hunting purpose. The feed gate of this feeder is adjustable. You can easily control the flow of the feed according to your wish. This feeder helps the feed to flow fast. Made of strong and heavy Galvanized steel of 20 gauge. Has a durable and sturdy construction. Can feed more than 8 hogs at the same time. Keyhole slots are integrated so that you can hang the feeder. The Adjustable feed gate integrated. The feed saver lip is also integrated for saving the feed. Eligible for confinement uses too. The joints of this feeder body are quite weak. It can be broken down by few consecutive attacks by the hogs. These were the chosen hog feeders and feeder lights that are worth buying for any hunter. If you able to plan everything on hunting properly and put some quality foods into any of the feeders to make hogs come near you, then you surely will get the positive result without being into any trouble.